Help: My daughter is seven. And I found this in her room. I found this today in my daughter’s room. My daughter is seven. It was innocently sitting on the floor amongst the Polly Pockets, friendship bracelets and a variety of other crap seven-year-olds love to hoard. Where did she learn the word diet? How does she even know what a freaking diet is? Whose fault is this? Is it mine because I let her play with Barbies? Because sometimes she’s allowed to watch Total Drama Action? Is it because when I draw with her I can only draw stick figures? Seventeen Poosh-ups two times a day. I felt sick. Physically ill. Like someone had knocked the air from my chest. I could feel myself getting increasingly anxious the more words I was able to interpret from her seven-year-old spelling. Three Appals, One Per, Two Keewee Froots. I am smart about this stuff. I have a degree in early childhood studies. Our family focuses on and promotes healthy eating and healthy bodies. Our attitudes are reasonable and balanced. Weight has never been an issue in our home – it is, for the most part, irrelevant. I have never stood before my husband and queried ‘does my arse look big in this’. Ever. Is media to blame for this? Rid my bike three time a day. And then I got angry. Really, really angry. F*ck you society. F*ck you and your and stupid obsession with women and the way they look. How dare you sneak into my home with your ridiculous standards and embed them in my little girls head, polluting her innocence with your pathetic ideals. Jog/run up and down the driv way three times. Your unrealistic expectations will not win in my house. I am tired of the beauty and body obsessed arena we live in. I am tired of women being portrayed as objects to be saluted and admired or shunned and shamed depending on whether they measure up to societies idealistic standards. I am tired of the conformist attitudes. And then, because I was so tired (and sad, so sad) that I cried. 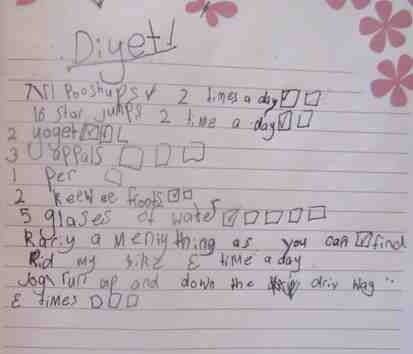 When Miss Seven arrived home from school I talked to her about her diet note. Turns out she learned about diets from one of her seven-year-old friends who was on one. So together we chatted about diets and beautiful healthy bodies and the gift that they are. I am not naive. I know this will not be the last time I talk about food and weight and bodies with my daughter. I am just ultra pissed that it had to start when she was seven. Amy Cheney is a sometime writer and mother of three little bitties (who quite literally drove her insane). You can check out more of her work here. So. Diyets. Diets. Have you ever spoken about dieting or body image with your children? How do you handle that conversation? How old were you when you first became aware of your weight?